Why the flirt poles? Because in addition to driving out of the neighborhood to walk in a safer area, I also want a fun way to exercise the dogs I’m caring for…without having to leave their fenced in yard. Sometimes walks just aren’t all they’re cracked up to be. I know you feel me on this. The flirt pole is what you’ve all been waiting for. It’s a an easy DIY toy (that you can also buy for under $30 bucks, if you hate making stuff). It not only helps your dog work on their basic manners and impulse control, but it also gives them a rockin’ workout in just a few minutes. And you hardly have to do a thing. 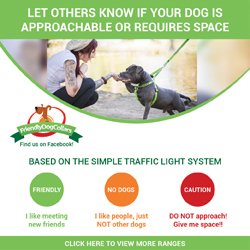 This is a great way to physically and mentally challenge your dogs, without leaving home. Wanna know more about this magic pole? Let’s do this in lists…ready? You drag the toy on the ground in a circle, they chase and tug, with rules. 1. It totally and completely exhausts dogs in record time. But it doesn’t exhaust you. 2. You can use it as a fun way to practice the following commands: sit, down, look, wait, take it, leave it, drop it. 3. You’ll be working your dog’s rile/recovery skills. That means they’ll get to practice listening to you when they’re in a state of high arousal (chasing and tugging) and learn to cool off quick (drop it and lie down) when you say so. Handy for reactive dogs who are working on impulse control. 4. You can tire out your dog at home, before going on a walk, so they’re more relaxed. 5. You can tire out your dog at home, instead of going on a walk, so you’re more relaxed. 6. 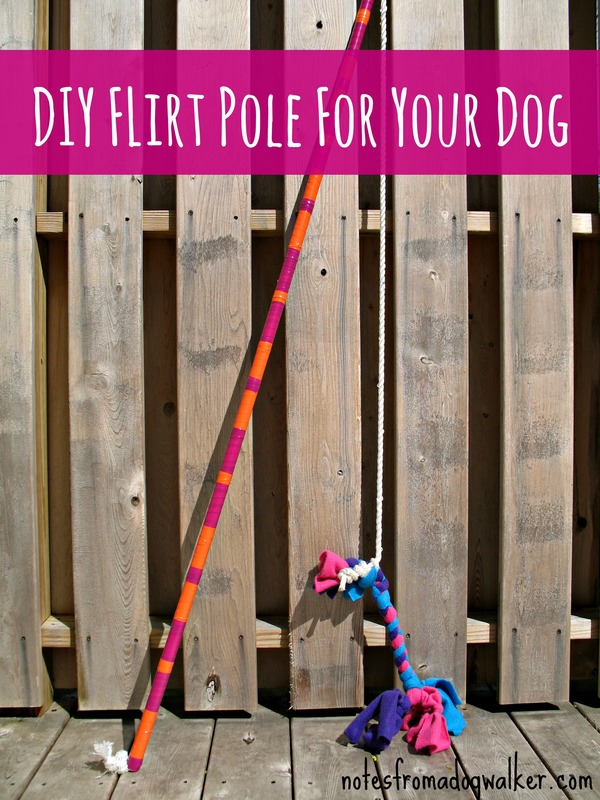 You can make a small flirt pole (half the regular size) and use it inside the house, if you don’t have a yard. 7. You can trick your cats into thinking they’ve shrunk, by telling them it’s their regular chase-it toy. 1. For a medium to large size dog, buy a 4-6 foot long 3/4″ PVC pipe, 10-15 feet of rope, and a dog toy. 2. Thread the rope through the pipe and tie a knot at either end of the pipe, to keep rope from sliding in and out. 3. Tie a toy to the end of the rope. 4. Optional: buy fun colored electrical tape (finally an excuse to buy lime green tape!) and wrap the pvc pipe so it’s all fancy schmancy pants. 1. Dog must lie down, look at you, leave the toy alone, and wait for you to release them, before playing. 2. When you tell them to “take it”, then they get to chase. 3. After a few passbys, reward them by allowing them to catch the toy. 4. Let them tug until you tell them to “drop it”. 5. Have them lie back down and wait until they are calm. Then start again. 6. Change direction every once in a while, so your dog isn’t always running one way. 7. If the dog grabs the toy before you say “take it” or is mouthy or jumping on you: take a time out and/or start over. 1. If your dog has bad joints or injuries that could be aggravated by quick changes of direction and jumping. 2. If your dog doesn’t know the following cues: wait, take it, leave it, drop it. Practice with treats first, then a tug toy, then move on to the flirt pole. 3. If you do not know the dog well. It’s not safe to rev up an unfamilar dog. While this is one of my all time fave tools for shelter dogs (it tires them out so fast! 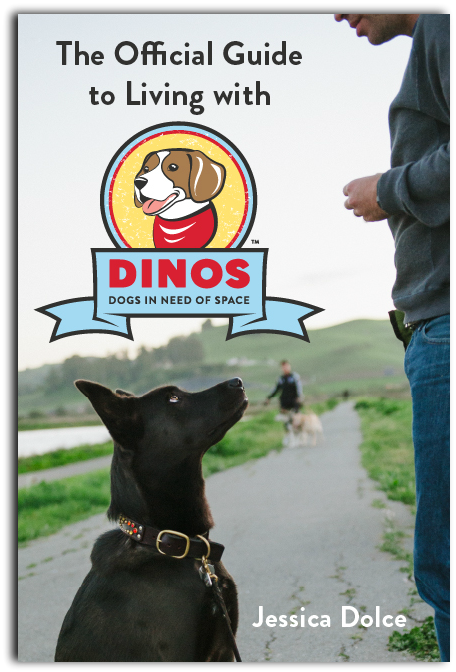 ), they must know basic commands and you need to have a relationship with the dog, before getting them super psyched. Establish a working bond first – make sure you’re communicating with each other – then start off slow. 4. 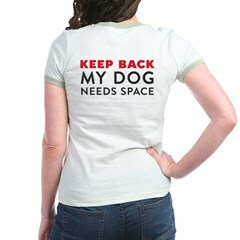 If this overstimulates your dog to the point that they can’t calm down after. You know your dogs. If this isn’t a good fit for them, just pass. 5. If your dog thinks it’s dumb. Some dogs just don’t dig it. Everything I know about flirt poles, I learned from Pit Ed Camp hosted by the badasses at BAD RAP. If you learned something here, it’s because of them, so feel free to click on over there and donate some scrills to support their work. Training Video: Flirt Pole Basics from BADRAP.org on Vimeo. Are you using a flirt pole at home? Tell me about it! Dude. I can’t stop taping things. It’s like crafting for the not-so-crafty. Please join me, so I’m not alone in my colored tape addiction. Great idea!! I’ve been looking for ideas for my reactive boy that don’t involve leaving the yard. Plus I’ve always wanted to find a use for those colored duct tapes!! Thanks a million! I love flirt poles! An even easier way to make one is to head out to your local Farm/Fleet type of store and purchase a cheap lunge whip in the horse department. Tie a toy to the end (we prefer the skineez-style stuffing free toys) and…voila! You have a flirt pole. I spent exactly $7 on mine. With my reactive dog, I do find we have to limit flirt pole play to a few times a week. It is a great way to tire her out, but it does get her arousal level up. Without a few days of “cool off” time I find that she’s a bit edgier than I’d like. But it sure is fantastic on a cold Minnesota day when you don’t want to go out for very long! This is what I use for my two dogs. It cost less than $10 and instead of a dog toy I just tie a fleece rag to the end. It keeps the whole thing nice and light weight which lets me flick it about and frustrate my two herders to my heart’s content. They always manage to get me though, by coming at it from both directions, clever herding dogs. A quick game of tug, an “out”, a breather, and we’re ready to go again. The other great thing about the whips is that they are constructed as one solid piece from tip to handle, so they are extremely durable and can take a lot of force. I, too, prefer the lunge whip version – much easier to hold than PVC and I get more “reach” so the dogs don’t have to run in such a tight circle. Here’s a vid I made showing how we use it: http://youtu.be/wSKkQcE7Mcs . I change up obedience cues before play, have an implied leave it, and use our release cue instead of “take it”. I LOVE THESE!!!! They are fantastic even for non-dinos. I use it with my parents boxer in the yard and in agility! It’s a super awesome tool for all the reasons listed above! We used it in obedience class for a non-food motivated pup (worked great as a reward for recall exercises) and the parents reported such great success at home in both tiring him out and maintaining focus during training. Even for those who don’t have fenced in yards, if you can put your pup on a long line and just drop the line on the ground (they usually run around it without getting tangled) just incase they lose focus on these awesome toys. oh my gosh! I have a rope with a toy tied to it that I use inside for my two boy cats and my pit bull always gets in on it! She LOVES chasing and pouncing and even jumping in the air to catch the toy on the rope! Even more than the cats! I thought I had invented a new kind of game, but now I see everyone has been doing it! I’m so glad I found this article. I recently bought one of these poles and have seen them used, but couldn’t remember exactly how to do it. Great instructions and video! Brodie, my pitty, LOVES his flirt pole. I bought one about a year ago after seeing one used on ‘It’s Me Or The Dog’. He’s very high energy and reactive, and this thing gets his ‘jitters’ out for pre walk/run/hikes, really helps him to regain his focus while he’s amped up, and it’s downright hilarious to watch him playing with it. Plus if I’m tired/in no mental shape for a walk, 15-20 minutes with this toy and he’s exhausted. I wish I had realized I could have made my own so easily, although the one I bought wasn’t expensive. I want bright colored tape on things! I’m so glad it’s a big help for you guys! Even though you have one already, I think you should make a new flirt pole – just so you can get your fun-color-tape on! I have three pit bulls at home, only one will work the flirt pole. The trouble is, Rocky is afflicted with ataxia. The girls couldn’t care less for the furry thing darting around the yard just inches from their noses. I have to be very careful for Rocky, his back end has a mind of it’s own that rarely jives with his front end. He has a very high energy level, thankfully he is a sturdy dog! The flirt pole really gets him going, and is a great way to quickly burn off excess energy. 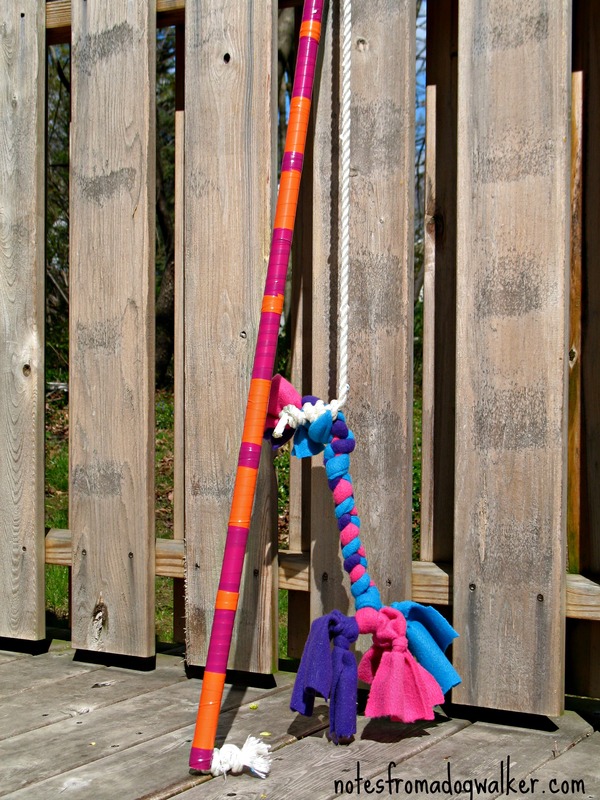 I made one with a bamboo pole, thin rope and worn out unstuffed playtoy. Almost zero cost! Thanks you guys – your flirt pole looks great! I want to add one benefit of the flirt pole: most dogs come with the natural, innate instinct to chase things, catch things, and bite things. When we give our dogs a good outlet for that drive, it can reduce their desire/need to exercise that drive on things that are less desirable to us, like our neighbors’ cats, toy poodles, etc. I think I’m gonna write about this idea, actually! A treadmill might be a good way to exercise them indoors! My pittie make a walk every day 30 min in the treadmill. Before walk outside or go to the training class. she is full of energy all the time!! (she has only 13 months).. A tired pittie is a happy, balanced dog! I love your post!! so many awesome ideas!! Thanks for the info!! That video impresses me! I have two greyhounds one retired racer and one school flunk out. It’s astonishing the complete personality change when the flirt pole comes out. They are no longer my cuddly well behaved snugly buddies but they become predators instantly. The school drop out looses her mind when the flirt pole comes out. She’s got some impulse control issues that are getting better. Wicked smart and if I’m not paying attention will go after my armpit, since she can get the lure if I drop the pole. The retired racer gets excited but this deadly predator mode. If she actually catches the lure I cannot get her to drop it. I can hang her up in the air, pry her jaws open (although sticking your fingers in her mouth at this time is a very very stupid thing trust me!) backing her up into something, leading her inside, using a hose to distract her, etc. This is my most well behaved angel! You only have to look at her sideways and she takes that as a correction. I tried to teach her to drop it and finally gave up after my hand got nailed pretty good. We use the flirt pole with muzzles! Their adrenalin just is so jacked up from that prey drive. Keeps everyone very safe and exhausted within 4 minutes. They LOVE that flirt pole and it gives me an idea of what could happen if a bunny or stray cat gets in the yard! Maybe some day I will try to gain control even in the presence of that crazy prey mode, but I’m not sure it’s even possible. I just try to keep everyone safe and let them enjoy for a few minutes. I used something similar for my cats and they loved it. My dog, however, is not toy oriented and wouldn’t be bothered. We made one after reading about this on Badrap too! It was the saving grace for our energetic new rescue. Once we taught him the basic commands, this was the key for perfecting them and practicing “settle.” And it’s the only way we can wear him out!! But I never thought of decorating it…love it!! I just discovered a whole new line of fancy, fun duct tape at Target. Check it out for flirt pole decorating ideas! FINALLY something I can use my glittery shiny silver tape for!! I want to hug you for writing that dogs should “lie” down. Besides that, this is a great idea! I saw that too!! I was so happy! Hello! I was wondering about the best length of the PVC pipe for a medium to small dog? My dog is ~13 kgs and ~40 cms to the withers. I was thinking about 1 meter of pipe, would that be alright? Is it better to have a shorter or longer pipe for more control? Thanks! I’m not sure – I’ve only ever used these with larger dogs who tug really hard, so I like my flirt poles really sturdy. If your dog has a lightweight style of play, a smaller pole might be fine! Based on your answer, I ended up with a 1,30 mt just in case hahaha thanks :). I make my flirt poles out of lunge whips with an old toy tied on. 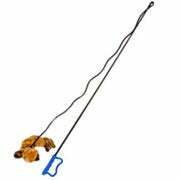 Total price $10 for the lunge whip at most feed stores. Was the 1st dog in the video deaf as I noticed that you gave him/her a thumbs up? The white dog in the video (the late, great Honky) was deaf – good catch! I want to make something like a flirt pole for my adult great dane, german shepherd mix but he is afraid of sticks, he’s a shelter rescue. What’s a good alternative? Long rope with toy on the end? Some folks use a horse riding crop with a toy tied to the end. Bite and leave mark - Page 3 - Poodle Forum - Standard Poodle, Toy Poodle, Miniature Poodle Forum ALL Poodle owners too! What kind of games can I play with my dog to harness his engery? My dad made Archie a flirt pole! Advice for puppy and kids? Tips on fostering good relationship? - Page 3 - Poodle Forum - Standard Poodle, Toy Poodle, Miniature Poodle Forum ALL Poodle owners too!